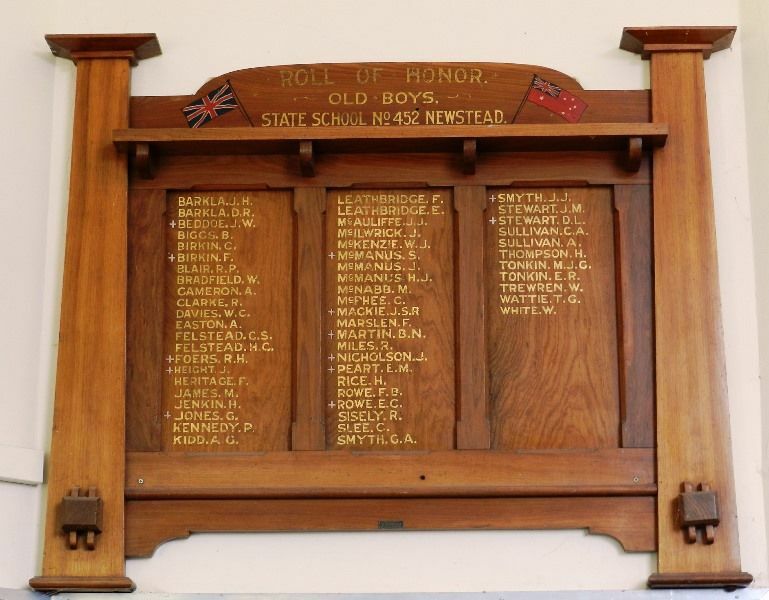 A wooden honour roll commemorates former students of the Newstead State School who served in World War One. Anzac Day was celebrated at the Newstead State school on Thurday afternoon. There was a good attendance, and everything passed off successfully. Mr F.W. Ellis, the head teacher, with his assistants had all matters arranged for the convenience of the visitors, and when extending a hearty welcome, expressed pleasure at seeing such a representative gathering to witness the unveiling of the honor roll erected in memory of those who had left to perform one of the bravest deeds in the history of Australia. The Revs. C.L.Moyes, W. McDermid, T. F. Butler. Cr. H. J. Bradfield. the president of the shire, addressed the gathering. Several patriotic numbers were rendered by the children, with Miss E. Harte as pianist. The unveiling of the honor roll was performed by Mr E. R. Davey, inspector of schools, who during a spirited address referred to the important and far-reaching duties devolving upon every eligible man and every citizen, as every man and every shilling were required to save the world from falling into the power of the Hun enemy. 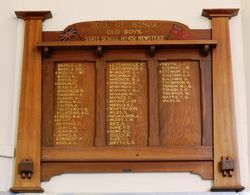 The speaker eulogised the action of Miss Hunter, who had generously donated the honor board, and by the number of names on it. He said that the Newstead district was well represented in the great struggle. The saluting of the flag and the singing of the National Anthem closed the proceedings. Castlemaine Mail (Vic), 27 April 1918. State School No 452 Newstead. 303 -5 Lonsdale St. Melbourne.